In a 12-inch ovenproof skillet over medium-high heat, add the ground beef, break into small pieces with a wooden spoon, and season with 1 teaspoon salt and pepper. Cook until no longer pink then drain the fat, remove the meat from the pan and set aside. Warm 1 tablespoon olive oil in the same pan. Add onions and cook 5 minutes. Add the garlic and bay leaf and cook one more minute. Add thyme, carrots, celery, potatoes and parsnips to the pan, and cook 5 minutes. Sprinkle with flour and cook, stirring for 1 minute. Add the tomato paste, Worcestershire sauce, beef broth, stout beer, stirring and bring to a simmer. Allow the mixture to cook for 8 minutes, then stir in the peas, cooked ground beef, and another ½ teaspoon of salt & pepper. 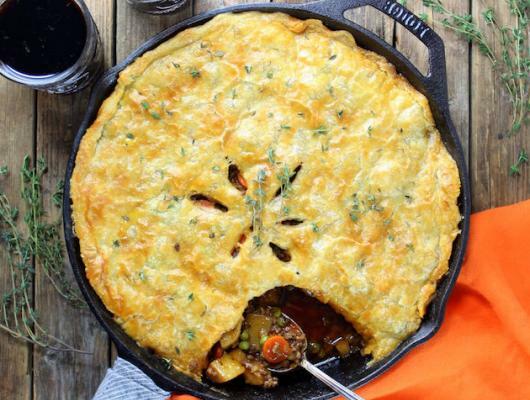 Remove the bay leaf then cover the pan with the puff pastry dough, carefully crimping the edges to fit inside the pan. Brush with the egg wash, make 6 slits with a sharp knife in the center of the pie, and bake at 400°F for 20 minutes or until pastry is golden. Let the pie rest for 5 minutes before serving. 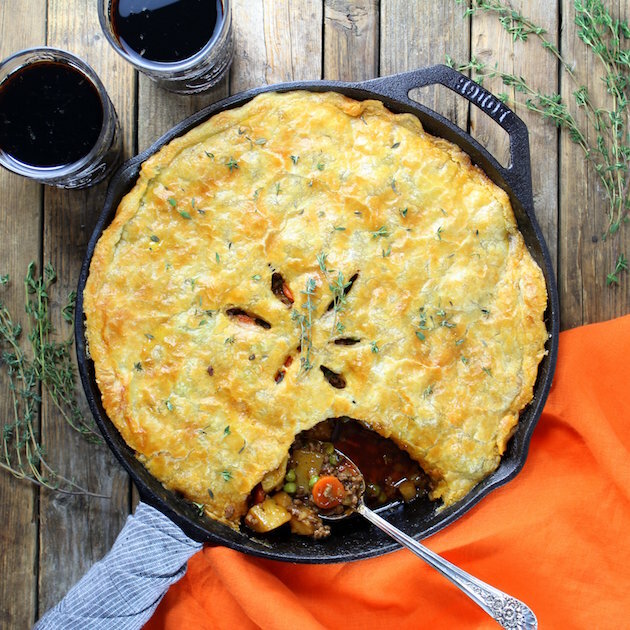 Cottage Beef Pot Pie with potatoes and parsnips, ground beef, carrots, peas, and stout beer - topped w/a light and crispy puff pastry crust. Check out my blog for other delicious recipes!